Hello! Today I have a wishlist for you all, I used to do wishlist a lot but haven't done one in quite a while! This wishlist features Little Birdie London which is a new online jewellery store, I found their website recently and think they have some really cute items! The Green Friendship Bracelet is so pretty, I absolutely love this colour and think it would be perfect for the summer! The Deer Studs are also really cute! I have so many earrings and I always love to find quirky ones, these ones are perfect! The Two Skull Skinny Cuff is something I have seen a few times before but with animals on so I really love the skull, for a girly girl I actually really love skulls and own a lot of jewellery and clothes with them on! I think they really toughen up an outfit, I also love gold jewellery! I saw the Candy Bunting Necklace on another blogger and it looked super cute! Statement necklaces are in fashion at the moment and I love to wear them with a simple outfit so they stand out! 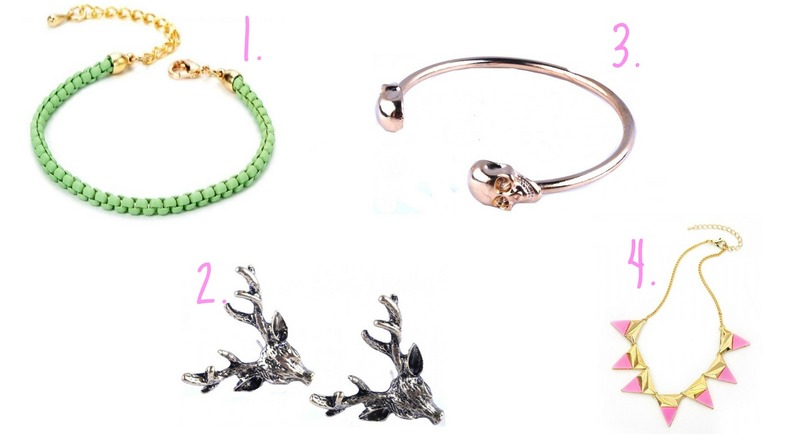 Have you tried any jewellery from Little Birdie London? that green bracelet is precious, love the colour for spring! hope you'll stop by for a visit to my blog sometime! Those deer studs look awesome. Can't believe they're £2! the candy bunting necklace is so cute! perfect for spring summer !